Learn how to use Excel with tutorials, tips and tricks on functions, formulas, and features. The eligible work hours in a given work day start and end at the same time each work day. Weekend days do not count as work days. The weekend is defined as Saturday and Sunday of each week (look ahead to Non-Standard Weekends with NETWORKDAYS.INTL to change this). Holidays, as listed, do not count as work days. Partial work days at the start and end of a date period are included for their fraction of hours. If the start time of the work day is later than the end time of the work day, the formula nets zero. If the start date and time is later than the end date and time, the formula nets zero. If your definition of weekend is different than above and you have Excel 2007 or newer, you can look ahead to Non-Standard Weekends with NETWORKDAYS.INTL to change this. If you want to include all 24 hours of each work day rather than a specified range of work hours, you can look ahead to 24 Hour Net Workday Hours Variation to tally the total number of hours each work day. In order to calculate the net work hours between two dates, we need to have some information to start with. Here are the variables necessary to make the net work hours formula work. $Start_Time – This is the time that the work day starts, as an Excel-formatted time. (e.g. 9:00AM) No date should be attached. The variable is marked with a dollar sign because you will probably want to anchor this cell reference in the formula. $End_Time – This is the time that the work day ends, as an Excel-formatted time. (e.g. 5:00PM) No date should be attached. The variable is marked with a dollar sign because you will probably want to anchor this cell reference in the formula. HolidayList – This is a named range containing a list of days that are to be considered holidays and not counted as work days, even if they are not on the weekend. (e.g. New Year’s Day – 1/01/2013) It is usually located elsewhere on the worksheet. 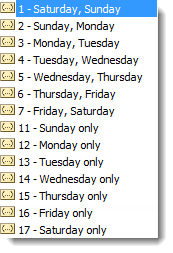 The function NETWORKDAYS takes an array input called [holidays] that lists all the non-weekend days that should be excluded from the calculation. This means that we could give the function a series of dates in brackets, but they would need to be formatted in Excel date format. This means that they need to be converted using a DATE function. 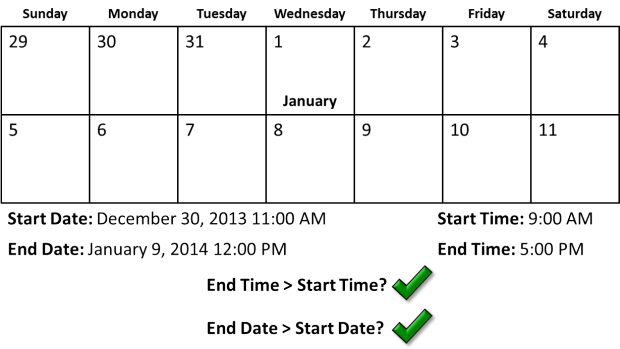 (See the Definitive Guide to Using Dates and Times in Excel for an explanation.) An easier approach is to build a named range. In a separate worksheet tab, or in an un-used portion of your current spreadsheet, make a column list of the dates you want to include as holidays in Excel date-format. You can either use a DATE function to specify the year, month, and day for each, or let Excel auto-convert as you type. With your list selected, select the cell name in the name box, type in “HolidayList“, and press ENTER. You have now named the selected cells as an array. It can be referred to in the net work hours formula as HolidayList instead of manually entering the range, and the NETWORKDAYS function can automatically exclude those dates from calculations. Here is the formula, in all it’s glory. Replace the variable names like $Start_Time and HolidayList with your specific references. You can look to the sample file at the end of this post for an example of the formula in action. We’ll walk through how it works in a moment, but first, let’s look at a couple of variations that can solve different versions of the net work hours problem. If you just enter 1, NETWORKDAYS.INTL behaves identically to NETWORKDAYS. Other options give you additional flexibility on your definition of “weekend”. Note the change to NETWORKDAYS.INTL and the use of 3 as the input for the new [weekend] term in the function. If you need to use a non-standard weekend definition, you can replace the NETWORKDAYS functions in the formula with the NETWORKDAYS.INTL as shown in the Non-Standard Weekend section above. There are a lot of moving parts to this formula, so it is useful to step through it procedurally. We’ll use an example case to walk through the logic of the formula step-by-step. Start_Date is December 30, 2013 at 11:00 am. End_Date is January 9, 2014 at 12:00 pm. HolidayList includes only January 1, 2014 (New Years Day). Check if the dates or times are impossible (i.e. the period ends before it starts). If so, return zero, otherwise, continue to step 2. Add the total number of days in the date series, minus weekends and holidays. For every work day between Start_Date and End_Date, count only the hours between $Start_Time and $End_Time. This is the outcome of the subtractions in the formula. Add up the partial days in all the periods and multiply by 24 to calculate the total net work hours. Here is a set of examples of the three variations of the net work hours formula. You can download the file by clicking the green Excel icon in the bottom right. Get the latest Excel tips and tricks by joining the newsletter! Andrew Roberts has been solving business problems with Microsoft Excel for over a decade. Excel Tactics is dedicated to helping you master it. You can read more of his writing on his personal blog at NapkinMath.io. Join the newsletter to stay on top of the latest articles. Sign up and you'll get a free guide with 10 time-saving keyboard shortcuts! Copyright Andrew Roberts. All Rights Reserved. Get a free guide to Excel keyboard shortcuts when you sign up to the newsletter!